SD-C50 wood moisture meter produced by China SHUNDA company permits to measure the moisture content of many kinds of wood products ranging from 200 to 1000kg/m,quickly by simply contacting and eliminate wood damage. The precise dielectric constant measurement with HF waves can get the moisture content of the depth of 50mm at most. Before measuring,get a right selector according to the tree species table or wood density.For example,ceiba density is about 0.4g/cm,so when measuring ceiba wood,the right selector is 4. With the sensor of SD-C50 touching nothing,press“ON” button.Turn carefully“ZERO”button till the result on the screen is between 00.0±0.5. With the sensor of the meter,touch the wood to be measured fully.As soon as the meter is in touch with the wood surface,the moisture content is indicated. 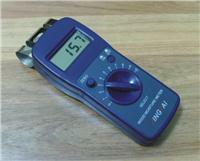 The wood to be measured should be wider than the sensor of the meter. Measure wood in the direction of the grain. Nothing else can be placed under the wood to be measured,otherwise the measurement will be inaccuracy. If the wood to be measured is not thick enough,put several pieces together until it reaches 30 mm in thickness at least. When turning“ZERO”，the figures on display are vague or always out of 00.0±0.5,it means that the battery has used up.Another battery should be replaced.